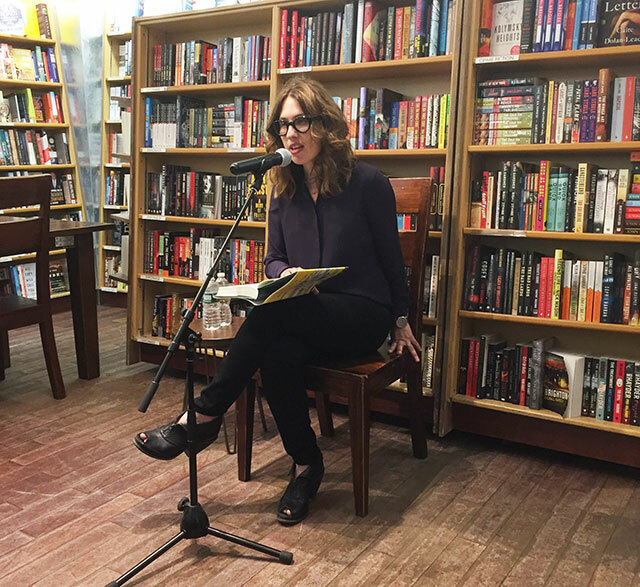 Lauren Grodstein was at McNally Jackson books to read from her new novel, Our Short History. The novel is written as a letter from a dying mother to her son to read in the future. Grodstein read from the beginning of the novel before taking questions from the audience. Our Short History begins with political consultant Karen Neulander explaining that though she appears healthy, she is slowly dying of ovarian cancer. Her six-year-old son Jacob will be given her letter, the novel, when he is older. Jacob’s father, a one-term Congressman, is not in his life. The concept of the came about after a friend was diagnosed with ovarian cancer, but still seemed healthy. This lead her to wonder what she would say to her own child if she were sick with a terminal disease. Grodstein says that her own son, in the audience and also about Jacob’s age, doesn’t love this book. Written from Karen’s point of view, its Grodstein’s first written from the perspective of a woman. She believed when she was a younger writer that books written from male perspectives had more credibility, especially for new authors. By the time she started writing Our Short History, she was in her late thirties and was willing to write from the perspective a woman because she cared a lot less about what other people thought of her. It took her a long time to learn she could separate herself from characters, so while Karen is similar to her, she’s also very much not Grodstein. “I got older,” she said, adding the best way to become someone else is to read a lot. The novel was written in about four months, but then Grodstein spent another two years editing it. Her advice is to write ten pages a day. The tough part of this novel was spending all day thinking about what it would be like to not be around raising her child. Every day she entered that world and the mind of Karen, facing her own demise. Two women Grodstein knew died while she was working on the book, both with young children. “I wanted there to be humor here,” she said, because she needed moments that would make it possible to write and read the book. Grodstein loves doing research for her books because she can feel as though she accomplished something even if she isn’t writing. She spoke to her brother, a physician. She researched political campaigns to craft Karen’s career. The career choices of her characters are always based around things that she finds interesting but that she doesn’t do herself. As novels come to a conclusion, Grodstein says she finds herself running out of steam. She often ends things too soon, though her goal is to leave readers wanting more rather than to force them to read through a final chapter that shouldn’t be there.